The Sprint edition of the RIM BlackBerry Bold has gone on sale via the Sprint website today, according to BoyGeniusReport.com. 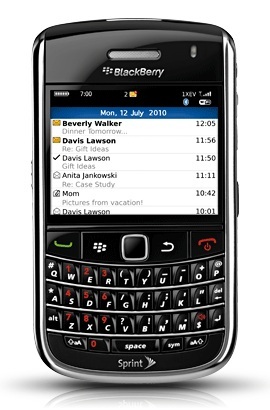 The Bold 9650, which started out life as the BlackBerry Tour 2, will eventually replace the Tour on Sprint's Now Network. The BlackBerry Bold 9650 can be purchased for $199.99 after a $100 instant rebate and a $100 mail in rebate when you sign-up for a new line of service or add a 2-year contact extension to your existing plan. For more information and upgrade pricing, visit the Sprint website. For detailed product specifications on the BlackBerry Bold family of smartphones, visit the Research In Motion BlackBerry website.